Now you know which companies have you on their e-mailing mailing list. I was looking back at my Oscar acting predictions from this time last year, and feel like I did pretty well with a 65% accuracy rate (3 of 5 in lead actor, 4 of 5 in lead actress, 3 of 5 in supporting actor, and 3 of 5 in supporting actress). So, with the first round of award precursors around the corner (Satellite Award Nominations and National Board of Review winners come first....) I bring you my pre-precursor Academy Award predictions in the acting categories. A few months back I blogged about Graham Cracker Crumbs, and how I wish they just sold the crumbs in the store. Well, this year, for ten cents more (and an once or so less) we avoided the bag and rolling pin technique! Just one more thing making the Thanksgiving amazing! It's become a favorite yearly event to track down the shortlisted Oscar documentaries prior to Oscar nomination morning. This year 124 feature length documentaries qualified as potential Oscar nominees, and this weekend the 15 shortlisted documentaries were announced. These will be whittled down to 5 eventual nominees by the documentary branch of the Academy of Motion Picture Arts and Sciences. Below is the names and brief summary of the 15 films. Battle for Brooklyn, Michael Galinsky, Suki Hawley. Daniel Goldstein, fights of eminent domain in Brooklyn while a massive real estate development project is underway and he finds himself living in an abandoned building in the center of the project site. Bill Cunningham New York, Richard Press. Profile of New York fashion photographer Bill Cunningham, an early photographer who captured candid celebrities and regular New Yorkers. 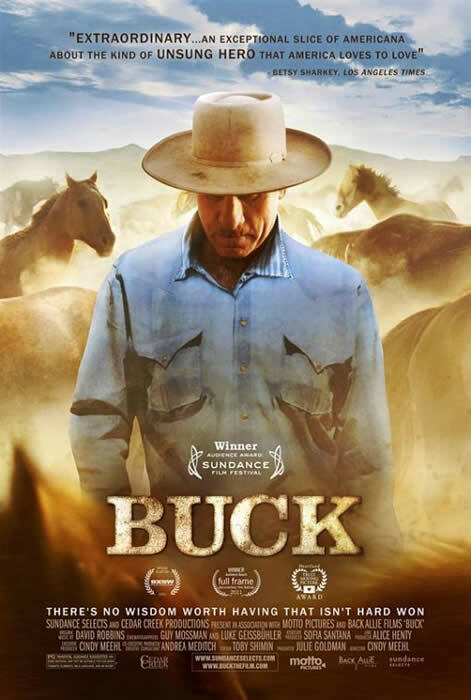 Buck, Cindy Meehl. Profile of Buck Brennaman, the inspiration for the Nicholas Evans novel, and later movie The Horse Whisperer. The film deals with Brennaman's childhood, abuse, foster family, horses. Robert Redford appears in the documentary. Hell and Back Again, Danfung Dennis. Afghanistan war documentary, focusing on a soldier dealing with the impact of heading off to war, and returning home. If a Tree Falls: A Story of the Earth Liberation Front, Marshall Curry, Sam Cullman. Documentarians explore the topic of eco-terrorism, including the arrest of Daniel McGowen in 2005, as well as an exploration of how the department of justice should handle eco-terrorism. Jane's Journey, Lorenz Knauer. The film takes a backstage and across the globe tour with the now seventy-five year old former primatoligist and global activist Jane Goodall. In addition to Jane Goodall, the film features Angelina Jolie and Pierce Brosnon. Paradise Lost 3: Purgatory, Joe Berlinger, Bruce Sinofsky. The third film in a series about the "West Memphesis 3," three teenagers put in prison for the death of three boys in Arkansas who we were released after 18 years when they were cleared by DNA evidence. Pina, Wim Wenders. 3D dance film about German dancer and choreographer, Pina Bausch. Bausch died unexpectedly at the beginning of production, and so instead of featuring Pina herself, features other dancers sharing and performing. Project Nim, James Marsh. The documentary revisits the story Nim Chimpsky, a chimpanzee made famous when taken from his mother at birth, and raised like a human child in the 1970s. Nim Chimpsky died in 2000, but this documentary using archival footage explores the impact on the experiment on the animal and human trainers. Semper Fi: Always Faithful, Tony Hardmon, Rachel Libert. Master Sgt. 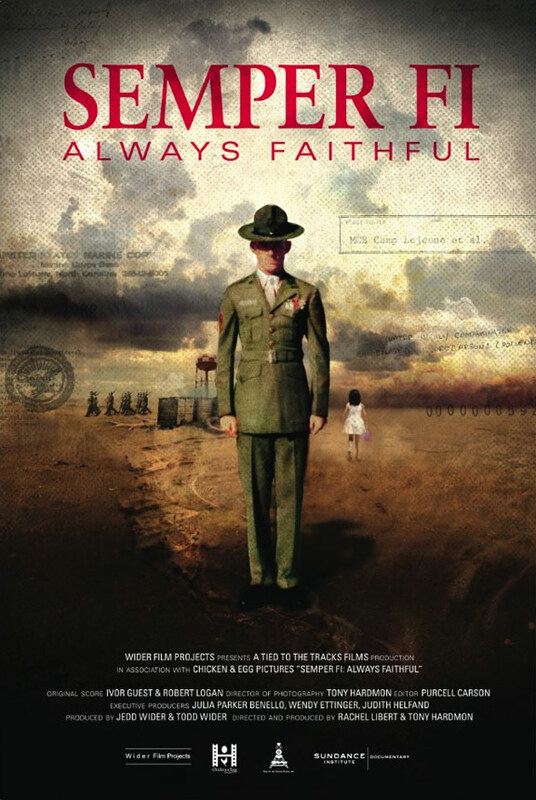 Jerry Ensminger, a devoted marine drill instructor experiences an earth shattering change when his 9 year old daughter Janet dies of Luekemia. Jerry discovers a Marine cover-up associated with water contamination at Camp Lejune and the film explores the cover up and Jerry's request for the marine corps to be faithful to the soldiers and families exposed to the contaminants. Sing Your Song, Susanne Rostock. A film staring Harry Belafonte, dealing with Belafonte's role in the civil rights movements. 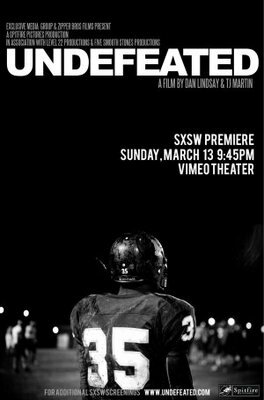 Undefeated, Daniel Lindsay, T.J. Martin. The story of Mephasis' Manassas Tigers, a losing football tea m that was able to turn it around on the field and in the players academic performance as well with the addition of a new coach, Bill Courtney. Underfire: Journalist in Combat, Martyn Burke. A series of interviews with journalist in various war torn area, dealing with the impact of war journalism include post-traumatic stress syndrome, adrenaline addiction, and callousness to tragedy. We Were Here, David Weissman, Bill Weber. The film is reflecting documentary about the arrival of AIDS in San Fransisco, and how the city and it's inhabitants dealt with the rapid spread of the virus in the first year. American Idol's Scotty McCreery Shows you How to Pack An "Operation Christmas Child Box"
My family put together our boxes for the Christmas project by Samaritan's Purse, called Operation Christmas Child. We've been doing it for a few years now and has become an important Christmas tradition for us. Here's a video of American Idol's Scotty McCreery putting together his box. I tend to be critical of the 3D film medium, but since the discussion has recently been growing over retooling favorite films into 3D, I decided to try to think of the movie that would make the least amount of sense in a 3D format, based upon the lack of three dimensional action, or scenes. The Winner: And after much deliberation, I've concluded that Before Sunrise, a great movie in the 2D format, would be by far one of the most pointless movies in 3D. My runner-up: The Social Network. What's your nomination for the movie that would be completely pointless to remake in 3D? 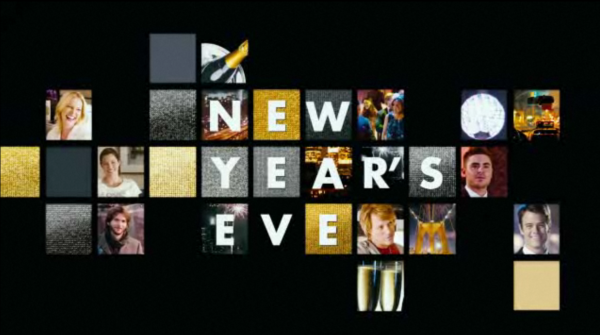 So, the commercials for New Year's Eve crack me up, because they have no shame in the fact that it's a follow up to Valentine's Day. Not a sequel, but more of a "remake" of a movie that I think by any standards can only be considered marginally successful. But it makes me think - what gets this romantic-celebrity-squeeze-them-all-into-two-hour-event-holiday-related-comedy can we expect next from Garry Marshall? I recently wrote a post about sorting through holiday e-mail advertisements that come your way, and this is an example of the bizarre things that come through our ad portals called e-mail. 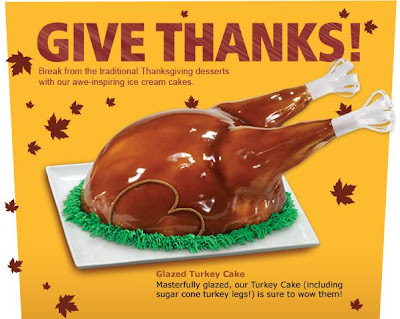 And frankly, this grosses me out, and I'm not sure if it's the glossy icing or the fact that it really does in some way resemble a turkey. Plus - I like thanksgiving pie - I certainly don't want an ice cream turkey cake, I think I'd be pretty disappointed to turkey cake after eating real turkey. Thanks Baskin Robbins for sharing this unique e-mail treat, but I don't think I'll be ordering one of these this year. 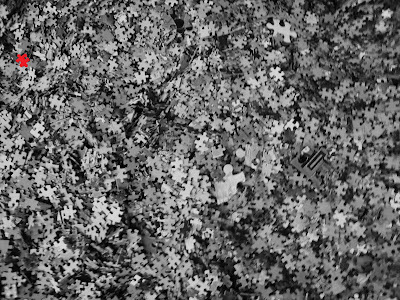 Can you find the red puzzle piece? I can tell the holidays are coming because my e-mail and mailbox is flooding with advertisements. Some catalogues and e-mails are reminders of previous events, gifts, and purchases. "Oh yes, I do remember buying something from this company five or so years ago, they send me these e-mails every year." While other times you wonder, how in the world did I get this e-mail for discounted plants and porcelain dolls. And honestly, I don't want any of it - I don't want the 15% off deal to a store I don't shop, or the today only special on Slimming Exercise Hot Pants. 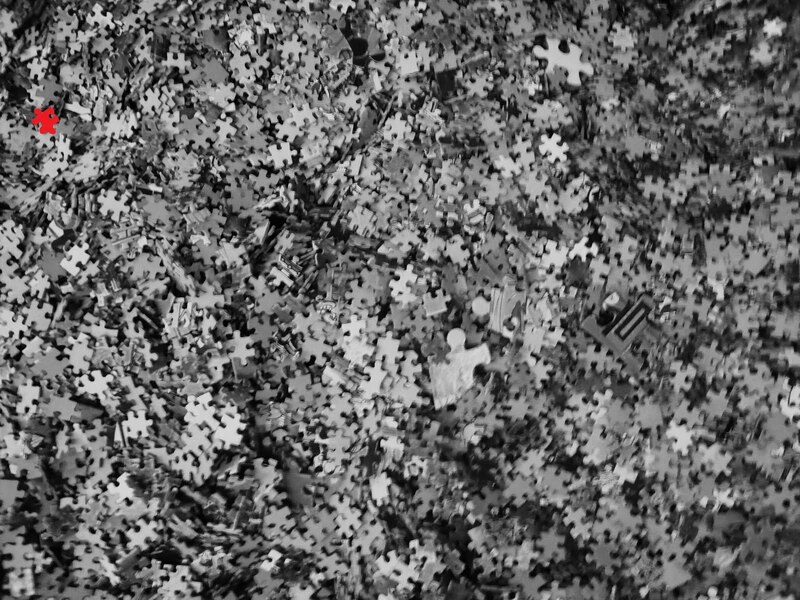 Yet, I'm torn between ignoring it all or looking for the red puzzle piece. It is the holiday season, and I'm going to buy stuff, and who wants to spend more than you half too? I remember last year I went shopping some place and saw every single person in line with a coupon, and felt foolish for paying full price. And so it begins - the choice to pay attention for that magic 4 hour sale or ignore it and just do it how you want to do it, at the cost of missing a magic sale, but perhaps preserving my sanity. 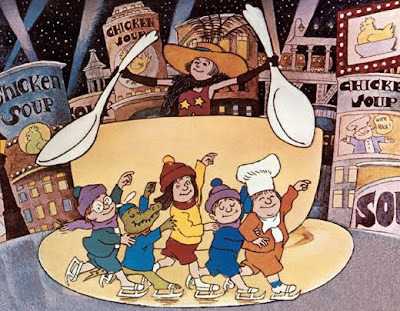 I'm having kindergarten flashbacks the past week or so and one of the memories that has flashed in my brain is the memory of singing on some degree of regularity the song "Chicken Soup With Rice" by Carole King. I recently pulled up the YouTube video with animation (and lyrics) by Maurice Sendak (author of Where the Wild Things Are) and watched it with my three year old. It brought back great memories, and she loves it as well. But today, we found footage on YouTube of the 1975 CBS Special footage of "Really Rosie" which this short was a part of, and enjoyed all the songs, including "One Was Johnny," "Alligators All Around," and "Pierre" (The boy who always says "I don't care" and gets eaten by the lion). I love when there's something like this that me and my daughter can watch or read that captures both of our creativity and attention. There's still a good deal of the 2011 film season in store, but in assessing the chatter, the predictions, and the buzz, it looks like this year's Oscar season in the acting categories will be generally "minority-free." Unless a foreign film pics up surprise buzz, it doesn't look like we'll have any Hispanic or Asian acting nominees in the field this year. 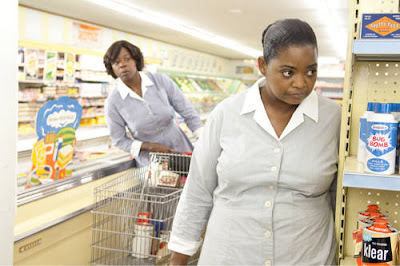 Instead the only non-white nominees in the field are Viola Davis and Octavia Spencer for their performances in The Help. Otherwise, it's all European-descent field. It'll likely be a mix of homegrown American, English, and even French performances (Jean Dujardin, Berenice Bejo). 2 out of 20 would be more than last year's awards for 2010 films (1 minority nominee, Javier Bardem), while the 2009 film awards had 4 minority nominees (Morgan Freeman, Gabourey Sidibe, Mo'nique, and Penelope Cruz). Not sure what it means, but probably speaks mostly to the films themselves that create strong critically praised films for minorities. We'll see what really happens, but this is how it's shaping up here mid-November. 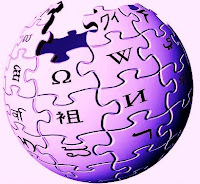 In 2001 the user-content generated encyclopedia, Wikipedia began. I don't know when I ran across my first Wikipedia page, but I have to think that it was maybe a few years after it's inception. As Wikipedia pages began to show up higher and higher in my search results, I don't know for certain if it was what I was looking for, but by the time the popularity of wikipedia began to grow, part of the buzz was also the skepticism. I remember people making jokes (they still do) about the possibility of putting fake and unverified content into the site. That being said, 10 years after the inception of Wikipedia, I find that I utilize Wikipedia regularly. Wikipedia is certainly not the home of scholarly research, or appropriate for any sort of academic exercise, but it's style, breadth, and general accuracy makes it a site I'd prefer to go to then most things that would randomly show in a search engine if I'm trying to figure out something simple like "what foods have vitamin A" "What was the plot of that 1990s movie" or "What songs by The Killer's were Billboard hits?" And so, I don't know how a 14 year old uses Wikipedia, but as an adult, what I'm looking up is probably more likely to be on Wikipedia (and formated in a way that is easier to access and find) than the standard multi-volume desk Encyclopedia. So, 10 years later, I can't really imagine the internet without Wikipedia - I don't spend hours there a week, but I probably at least go to a page or two a week - even if it's to win a discussion with my wife over the term "Olly olly oxen free." 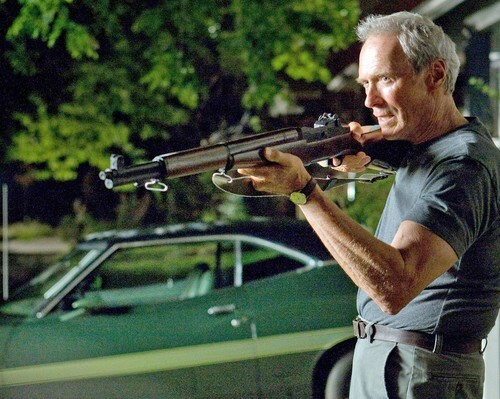 At 81, Clint Eastwood will have his film J. Edgar on the big screen in less than a week. Not-adjusted for inflation, here are Eastwood's highest grossing domestic box office takes. One of the things that sticks out to me, is that Eastwood has a staring role in each of these films, with the exception of Mystic River. Other film efforts, absence his acting skills, most recently, Hereafter (2010; 32 million), Invictus (2010; 37 million), Changeling (2008; 35 million), Letters from Iwo Jima (2006, 13 million), and Flags of Our Fathers (2006, 33 million), have performed much worse. J. Edgar seems like the big type of film that does well, but looking at these numbers, I have to wonder if J. Edgar will suffer. Perhaps Eastwood as director is making the simple casting error of not directing projects where he can direct himself in the lead role. "Daylight savings time with children doesn't mean an extra hour of sleep, or an extra hour on Saturday night. It means an extra hour Sunday morning." The nights are getting darker. The air is getting colder. One of the best times of film season is right around the corner. But alas, there's nothing good out in the theaters. Currently, half of the top box office films are rotten on the rotten tomatoes scale, and that leaves you movies like Puss and Boots, Paranormal Activity 3, Footloose. 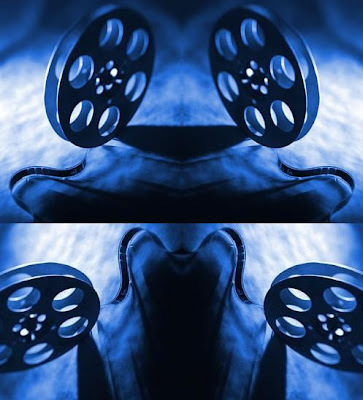 So what do you do when the movies leave you blue? 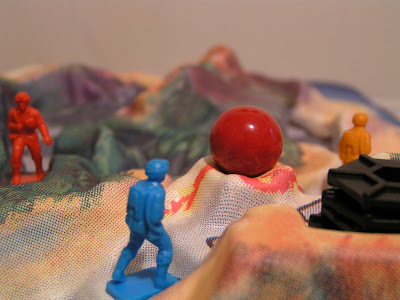 Watch reruns on Nick At Nite, play video games, revive your exercise patterns, hang out with friends and discuss the good old days, head to a coffee shop and begin the splash screenplay the world is missing, sleep and dream in color, re-watch the classics (or watch them for the first time)? 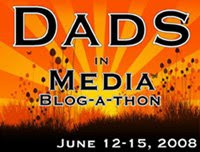 It seems to me, these days we're watching just a tad bit more TV than we previously did. Nothing incredible, but for us it's been NBC's Parenthood, Fringe on DVD (we just started season 3), usually The Sing-Off, and occasionally we'll see what else is on.